I love just about all the chores and jobs I do here at Hum Sweet Hum but the one that breaks my heart is weaning crias from their moms. Everyone is so sad. Listening to the plaintive cries of babies wanting their mommies and moms calling to their kids about breaks my heart. But one mom is on the thin side so for her best interest in gaining weight, it is time for mommies to day goodbye to their babies. It's day two of weaning and already, they are whining a little less and off grazing more away from the fence where they can get closest to moms. I use this time of weaning to my benefit and to work with the babies. I become the replacement of the nourishment and I take more time with them to hand feed if they will take their pellets that way or hold the bowl. It is a time when the bond and trust in me becomes firmly established. Babies are looking to someone to provide them comfort so my being the hand that feeds does just that. I have found future training goes much smoother and the bond and trust carries into adulthood. I try not to do anything negative with them for at least a week. No halter work and no major handling unless necessary. It's all good stuff I provide them with lots of treats and if weather is nice, the hose which they love. I must admit, being the giver of goodies helps me feel less badly about taking away their mommies too. One of the many things I love about the alpaca community is when someone puts a call out for assistance, people come through no questions asked. Today, I got one of those requests to provide alpaca socks to our troops stationed in Afghanistan. They are at high altitudes and cold weather. Thanks to Wings and A Prayer, the Alpaca Sock Brigade was established and we have a means to donate and provide some warmth to our troops. Please do what you can and check out their website http://www.bentstarproject.org/SockBrigade.html. They also need beanies and scarves so you knitters out there, dust off your needles and crochet hooks and lets support our troops. They also asked that we spread the word so please tell your friends and send them the link to Bentstar Project. Thanks! We at Hum Sweet Hum love our troops! One of the reason I chose to live in Oregon's Willamette Valley is because I was only one hour away from Oregon State University (OSU). 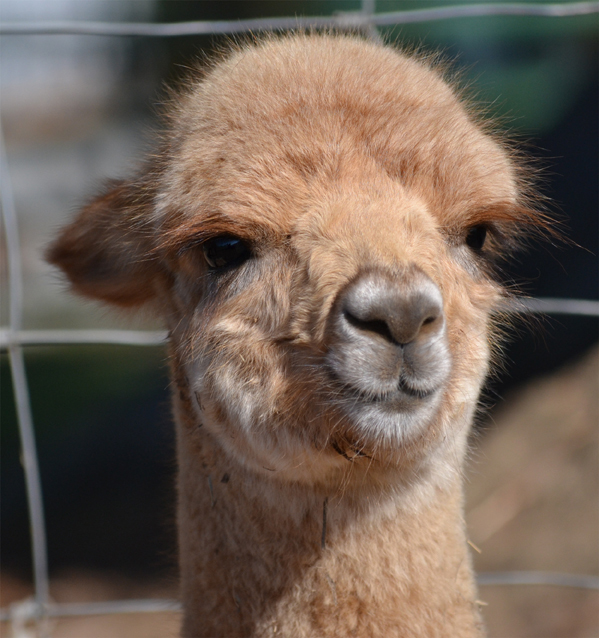 There, they have one of premier Veterinary Schools and hospitals specializing in Camelids. I knew they would have the best vet care if needed and I'd be close to up to date research on alpacas. I hoped I'd never need it but it was nice knowing that I was so close. My vet is very involved with OSU and their research so having him out to the farm is always a education as he shares the latest news from research studies coming out. 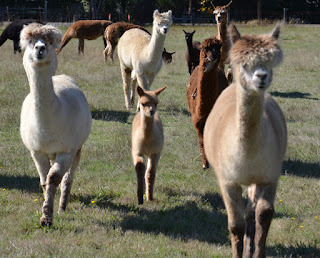 When my 5 month old cria, Djembe, was born with a heart murmur, Dr. Pat Long informed me of a new study that was just funded from Pacific Northwest Camelid Foundation to research camelid hearts using radiology techniques. He asked if I might be interested in having Djembe be a part of this research. I jumped at the opportunity since I'd get this amazing veterinarian care for Djembe under the study, and OSU would get a great opportunity to learn. It was a win/win. I loaded Djembe and Twister (his mom) into my Honda Element and drove the hour to Corvallis. My nearest alpaca neighbor came with me since it's always a great learning opportunity to go to OSU and talk to the various doctors. We were greeted by the Veterinary Student Sarah. She led us to the big room where we would get an ultrasound done. We met Dr. Venegas who was performing the research and specializes in radiology. It was awesome seeing so many students and doctors in various stages of their education come in and take advantage of Djembe and what he could teach them. He stood next to mom and nursed a lot. He is a stress eater! And when he was full, he still stood with his head under her for security. Twister was a world champion mom staying calm. She stood still the entire time we were in the room despite the multitude of strangers coming and going (I counted and we had 14 doctors and students in the room at one point). It was a great learning opportunity for me when I got to stay and watch the ultrasound. The doctors were great about showing me what they were seeing. The only ultrasounds I'd seen have been to confirm pregnancy and to my novice eyes, I couldn't tell if I was looking at his heart or if he was pregnant! Although so very interesting, it was stressful knowing that my little guy had a serious issue with his heart. The news was not good. He had a sizable hole in his heart and blood was leaking back through into the wrong chamber. I was told that as he grew, he'd most likely develop congestive heart failure and his prognosis for living longer than a year was bleak. I was saddened to hear that. The cardiologist who was also in the room and taking advantage of studying Djembe talked of doing a procedure that had been done on dogs before but never alpacas or camelids. She said she'd be interested in attempting it on Djembe if I was willing. Knowing this would be his only chance at having a normal and long life, I eagerly accepted. I took Djembe in last week to have the procedure attempted. Djembe and Twister loaded in the car again and off we went. It was hard leaving him not knowing if I'd be bringing him back or just bringing his mom back alone. They did a second ultrasound and got him prepped on one day and the next day was for performing the procedure where they would implant a device that would plug the hole. They were able to get a better look at what was happening inside his heart as they put the probe down the catheter into the jugular. They injected dye and could really see what was going on and they were amazed when they found that the hole had shrunk! They repeated the dye twice to make sure and confirm it. They aren't sure how or why the hole shrunk but it did. The ultrasound the day before still showed the hole but it's not as accurate a look. The wonderful news is that Djembe is going to get to live a normal life with his now small hole. It didn't need the device implanted as they intended. I was sad for the doctors that they didn't get to attempt their first implant procedure in a camelid heart but happy for Djembe and me that we got such great news. My little guy charmed all at OSU and taught so many up and coming veterinarians as well as some of the leading Veterinarians in the country and world! It was an honor being a part of research. 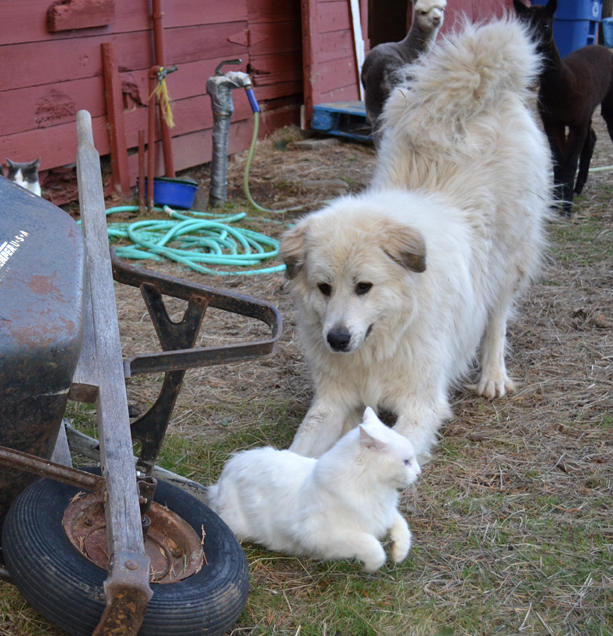 Having a livestock guardian dog has so many benefits. 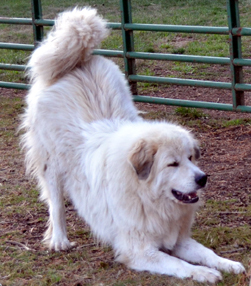 I searched the various breeds that are known for protecting herds and chose the Great Pyrenees. I found a breeder, Wings and a Prayer, that also is an alpaca breeder so the puppies are raised right along the alpacas from day one. Naming animals is sometimes a challenge but his name came quickly to me. Moose was chosen knowing what a big dog I was going to have. When he was a puppy, people didn't quite get the name but I said, "Just wait." Everyone that meets Moose now say what an appropriate name he has. Moose has amazing instincts. He knows his job and loves his work. He will run to the fence when he sees the neighbor's dogs out playing and he stands between them and his herd. He is non-threatening to them but he makes sure they know he is there and no one is allowed into the field without my permission. When he doesn't have anyone to shoo away, he chases the birds out of the field making it a big game. Moose is so lovely to watch when he opens it up and runs full head of steam to chase off whatever he feels doesn't belong near his alpacas. Moose knows his manners around the alpacas. I sometimes forget that he must wait for an alpaca to cross his path and I get impatient when I'm calling him and then I see his face that tells me that he doesn't have permission from the alpaca to move so I go out and step between him and his alpaca so he can. I feel sheepish after feeling impatient when he is doing what is appropriate around his alpacas. An added benefit to having my livestock guarding is how good he markets my alpacas. He actually helped sell some alpacas! 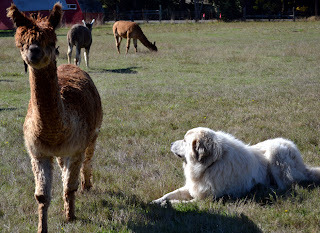 Potential new alpaca owners were debating on if they wanted to get these creatures for their property and then they met Moose and fell in love with him so much that they decided they needed to get a Great Pyrenees and of course some alpacas for their dog to guard! He is definitely a farm favorite when visitors come. After last farm day, Moose slept for two days. He was so tired greeting all the guests and being loved on. Moose has his favorites too. 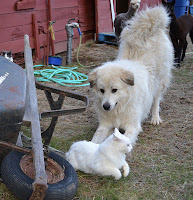 He loves his barn cats and herds them back to the barn after they have been out hunting and exploring. When he was younger and the cats were kittens just learning to go out and hunt, Moose would have a fit when he didn't know where his kittens were. I'd find them cuddled together for afternoon siestas and they rub in and out of his legs. The bad news is that the cats have taught Moose that it is nice to rub your head up and down legs. I'm so bruised from that Moose head rubbing on my leg like a kitty cat! He has one hard head that dog. Moose protects my herd, my farm and me. I sleep easier knowing I have a Moose On Duty! The next best thing to spending time with my alpacas is spinning their fiber into yarn. I was quite pleasantly surprised when I discovered how much joy spinning gives me. When I first started spinning, it was more about economics. With my limited budget, it made sense to learn how to spin and maximize my profit. The more it's processed by others, the less profit. Then the reality hit of how much time and labor it takes to make that skein of yarn and boy were my first few skeins rather hinky looking. But I later found out those are called "art" yarns and they sell for a lot AND once you learn how to spin nice and consistently, you take lessons on how to make yarn like you did when you were learning! Go figure. But as I got the hang of it, I found out that it is really relaxing. It is very zen like to sit and spin in the evening. Or sometimes when I really need to have a down day, I sit and spin and watch old movies. It's very restorative to a tired body and mind to have a day or afternoon of doing that. There is something about the zen of spinning too. In New Zealand after the major earthquake, The Ashford Company that makes spinning wheels noted that there was an increase in spinning wheel sales. The article I read stated that people were being attracted to spinning to help calm their jittery nerves. Dusting off my old master's degree in psychology, that makes sense. Using the bilateral motion of your feet (I use a double treadle), both sides of the brain are stimulated. There are psychotherapy techniques that use bilateral stimulation in treating trauma and Post Traumatic Stress Syndrome. Could be an interesting new modality for therapists! Are you bored just playing Farmville? Want to see if country and farm life is right for you before you make the big leap? Don't know anything about alpacas and need an adult 4-H before you buy? Try boarding first. Here at Hum Sweet Hum, I board for folks just getting started and don't have their own place yet. It's a great way to learn the ropes. 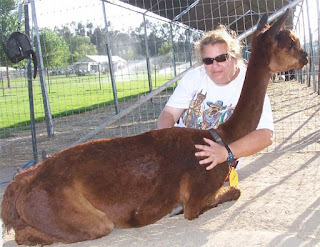 I teach you all the basics from trimming toenails and giving shots, halter training using my Positive Reinforcement Techniques to fiber processing the exquisite alpaca fleece, plus a lot more! And, you can't beat the cost. For about what you'd spend on a cup of coffee at Starbucks, you can board an animal. Boarding isn't just a good way to get started, it's fun and such a stress relief from your busy week and rush, rush world of city life. Being around alpacas, teach us to slow down. If you move fast around the alpacas, they don't want to hang out with you. Take a deep breath and feel that quiet energy alpacas are so good at putting out. Come give Jamilah or Jasmine a massage. Who would think that giving a massage feels as good as getting one but just ask anyone who has given these girls a massage and they will tell you, it is so relaxing to sit with them, getting to feel that soft fleece on the body of the animal still and having them enjoy the touch! Ahhhh, it is just this side of heaven for both animal and two-legger! Boarding will keep you from being bored! One thing with farm life is it's never boring! I get a lot of nice feedback on my logo but many don't know why I chose Kokopelli to be an iconic image to represent my business. When I first got alpacas, I decided to experiment with clicker training them. I was pleased how quickly they learned using this method of training and it's positive reinforcement techniques. As the alpacas learned that I was the holder of goodies and all they had to do was something silly like touch my hand with their nose and they'd get a click and a treat. Putting their noses in halters became a game rewarded with more treats. 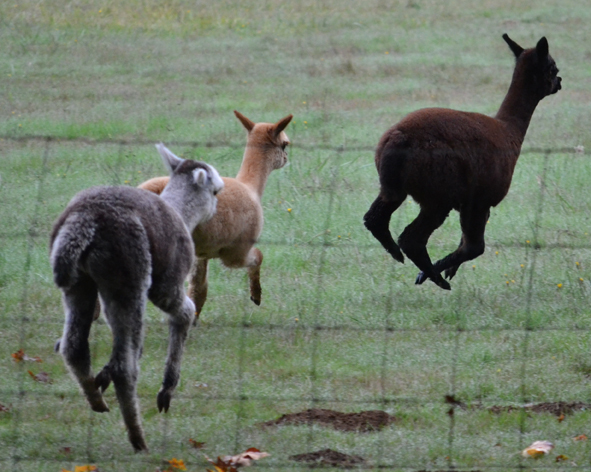 When I arrived at the farm I was boarding at, the alpacas would come running. One very hot summer day, I decided it was too hot to do any serious training. So I decided to experiment with them following me about the pasture going from one shelter to the next. It was a pasture of mostly weanlings between 6 months and a year old so still quite playful. I clicked whoever followed me and gave them treats when we arrived at the next shelter out of the heat. Then we went over under the shade of a tree. I had about a half dozen or more follow me. There was a nice dirt mount nearby so decided to run to the top of it and yelled, "Queen of the Mountain!" I laughed as all the kids that decided we were having a fun clicker game running to the top of the mound and jumped off kicking their heels in joy. Then I said, "time to roll in the dirt kids!" I pretended without getting down into the dirt the rolling motion and was amazed when one after the other of the alpaca kids came off the mound and rolled in the spot I had been in when I pretended to roll. We had a fun game of Simon Says filled with lots of clicks and treats. I felt like a true Pied Piper. After that incident, I found the Kokopelli image and thought that was perfect and representative of being the herdress and Pied Piper to my alpaca herd. I love my Honda Element. It is so handy. 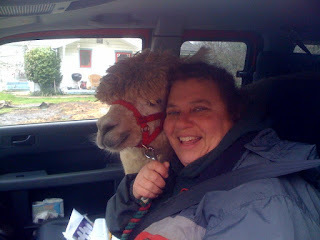 The seats fold up against the side of the car and I can take a couple of alpacas on short hauls. A few weeks ago, I went with my nearest alpaca neighbor Ann Dockendorf of Aragon Alpacas to pick up a dam and her cria from Bend, OR. It was a couple hour haul back to Eugene. Mother and son cushed in the back of the car. I put some hay in the back for them to munch on. It saved me money having my Element instead of a trailer because there were some really nice animals that would have been tempting to buy more of if I had more room than my economy car could hold! It's been real handy in emergencies too. Last summer, my girl Sprite broke her leg. She was carefully loaded in the back of my car and I got her to OSU to get her leg all fixed up. She has made a few trips back and forth to OSU for rechecks and she loves the car ride. She looks out the window and as long as I have plenty of carrots to feed her, she is one happy camper. Never a hum out of her. It's been handy to take a herdsire over for a date too. Funny how they are a little reluctant to get in that first time but if they get to go back for a second date, they sure hop in right fast! Talk about positive reward for a car ride! A date!!! !